Repeat after me: "Maxxis Locust CX tires are the greatest thing since coldcuts." After the third friggin' 12+" snowstorm in as many weeks, it was time to get the last of our Christmas packages mailed off since we could not deliver them in person, but today, Brenda had the car. 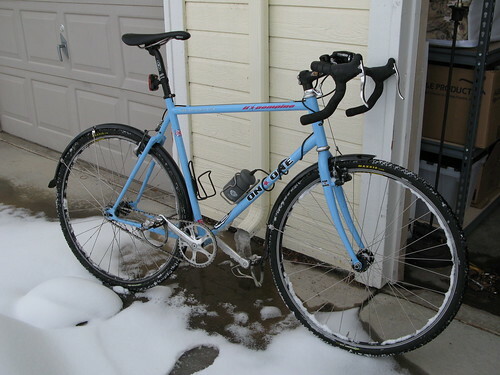 So, with my packages loaded in my messenger bag and my tires pumped to 75psi, I slowly rolled out on the Skunk Creek Path, slipping a bit but generally biting into the slushy icy muck. By the time I was at Scott Carpenter Park, I was passing mountain bikers and plowing through the worst of it, recalling the salient message of my very first bicycle lesson from thirty-three years ago: the faster you go, the easier it is to stay upright. I have now mentally mapped out every single turn (especially the off-camber ones) on the Boulder Creek Path, and have a new desire for disc brakes on my everyday bike, but overall today's ride was one of the most enjoyable rides I've ever taken. I got more coldcuts. Pending a favorable second tasting, I will post a review.